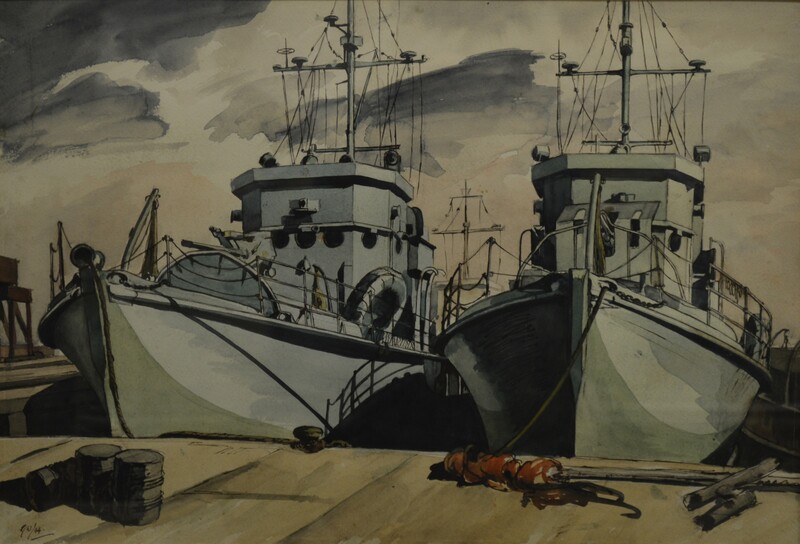 Baysgarth House Museum is currently hosting North East Lincolnshire Council’s collection of war art from Grimsby by artist Ernest J Worrall. Born in 1898, Worrall served as a machine gunner in World War I. Despite being captured and made a Prisoner of War, he escaped in 1918 before the armistice was signed. He graduated from the prestigious Royal College of Art in 1931 and exhibited at the Royal Academy, as well as teaching at a local grammar school. With the coming of WWII Worrall joined the Home Guard in Grimsby, getting an intimate view of the changes in the town and docks as hostilities advanced. Worrall’s vivid wartime scenes are felt to be among his best work. The exhibition has seen higher than average numbers coming in from areas outside Barton, many of whom bring their own memories with them! We have had people who remember playing in the spaces left after the demolition of damaged buildings, and even people who remember Worrall teaching at their school.